Thank you for your interest in the orchestra! Led by conductors Ace Edewards and Matt Wilkinson thorough 2018, Scruffy City Orchestra was founded in 2015 by a small group of musicians who thought it was time there was a community orchestra in Knoxville. We draw volunteer members from the greater metropolitan Knoxville, TN area. Our current conductor is Ace Edewards, although Matt Wilkinson remains closely associated with the orchestra. 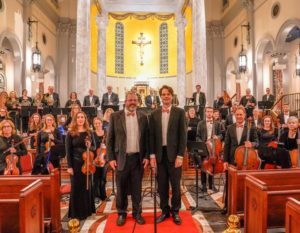 In November, 2018, SCO was invited to be part of the Cathedral Concert Series at The Cathedral of the Most Sacred Heart of Jesus in Knoxville. The Cathedral Concert Series is a program of the Diocese of Knoxville Music Commission and is dedicated to providing the community with free/low-cost opportunities to experience local, regional, national, and international sacred and classical music ensembles in the effort to support the Arts and foster appreciation for Sacred Music in East Tennessee. Scruffy City Orchestra is a 501(c)(3) non-profit, pay-to-play organization. Member fees are $50/year. We have two rehearsal/concert cycles per year. The summer-fall season runs from August through October with two concerts in early-mid November. The winter-spring season runs from January-April with two concerts in May. We do not rehearse in the summer. Thursday evenings during active sessions, 7-9 p.m.
Bring your own stand, instrument(s) and any other items you personally need (stand lights, etc.). Music will be provided or ISMLP inks will be e-mailed to members for personal print-out. Attendance is critical to the success of a community orchestra. Musicians must attend at least 80% of rehearsals to continue as members. Attendance at Thursday dress rehearsal the night before the Friday concert is mandatory. Please make every effort to attend the last two rehearsals in particular. If you cannot meet these requirements and want to continue as a member of the orchestra, speak to the Personnel Manager. Always let the Personnel Manager know as far in advance as possible if you must miss any rehearsal and inform your section leader as well..
SCO has two scheduled concerts per session. One is the Cathedral Concert Series performance on a Friday evening in Sacred Heart Cathedral on Northshore Drive in Knoxville. SCO performs the same concert as a Community Outreach Performance at a location to be named either a week before or after the Sacred Heart event. SCO also participates in various special musical events and competitions during the year.